Interesting facts and information about the Five Civilized Tribes and the reasons why they were considered 'civilised' by the Europeans and white settlers of North America. Learn about the government system of the tribes and how they were eventually removed from their tribal homeland - culminating in the tragic history of the 1000 mile march called the Trail of Tears. Definition: The Five Civilized Tribes were nations of Native American Indians who had assimilated cultural lifestyles and customs of the white colonists and settlers and had generally good relations with their neighbors. Who were the Five Civilized Tribes? The Five Civilized Tribes lived in the Southeastern United States until the 1820s. 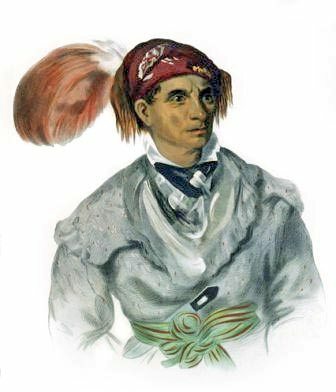 The Cherokee referred to themselves as the "Principal People" as they were the largest tribe living in mountain areas of North and South Carolina, Alabama, Georgia and Tennessee. The Five Civilized Tribes were were considered civilized by Anglo-European settlers during the colonial period and the early federal period. The term was used to describe this collection of tribes and peoples from the mid 19th century. Many of the Five Civilized Tribes, particularly the Cherokee, married people of European descent and so were “mixed bloods” even before 1800. The American Civil War (1861–1865) saw the political division of the Five Civilised tribes. The Chickasaw and Choctaw tribes fought predominantly on the Confederate side. The Seminole and Creek tribes supported the Union. The Eastern Cherokees fought for the Confederacy in the American Civil War. The Western Cherokees were divided, into Union and Confederate factions. The end of the American Civil War saw the demise of the Five Civilised Tribes. The treaties of the majority of tribes who had supported the Confederacy were put aside. Their lands were restricted to Eastern Oklahoma and their black slaves were freed. The federal policy of detribalization followed resulting in the loss of authority of the governmental functions of the Five Civilized Tribes. Land was divided into individual holdings. The Indian Removal Act of 1830 started the removal of the Five Civilized Tribes from their homelands to reservations in present day Oklahoma. A limited number of the people of the Five Civilized Tribes remained in their homelands. Some Choctaw in Mississippi, some Seminole in Florida, some Creek in Alabama and some Cherokee in North Carolina. By 1837 a total of 46,000 Native American Indians had been removed from their lands which resulted in 25 million acres being opened up for white settlement. The Trail of Tears was the name the Cherokee gave to the route they were forced to travel as a result of the Indian Removal Act. The Trail of Tears ran from their land in the East to the reservation land west of the Mississippi - it was a 1000 mile march. One of the chiefs of the Cherokee nation signed the Treaty of New Echota in 1835 which ceded all Cherokee land to the United States for $5.6 million. Many of the Cherokee condemned the treaty and resisted removal but 16,000 Cherokees were eventually forced off their land in 1838. Their tragic journey to the Indian Territory along the Trail of Tears was a desperate affair under severe conditions. Nearly 4000 Cherokees died on the Trail of Tears from malnutrition, exposure, and disease. The Cherokee refer to the Trail of Tears as 'Nunna daul Isunyi' which translates to “The Trail Where They Cried”. The Tribal location map provides a general overview of the tribal territories and land inhabited by various tribes of Native Indians including the Southeastern Five Civilised tribes. 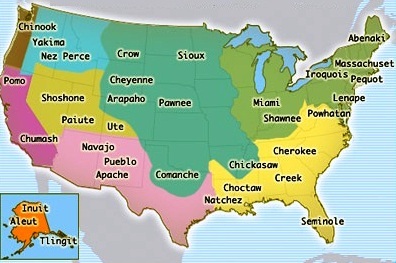 The Tribal Location Map provides a bird's eye view of the Five Civilized Tribes and their proximately to other famous Native American tribes and their tribal territories. The Five Civilized Tribes, the Cherokee, Creek, Choctaw, Seminole and Chickasaw tribes, were removed from their land and sent to inhospitable reservations. The Five Civilized Tribes waited until 1969 when all Indians were declared citizens of the U.S.
Five Civilized Tribes. Discover the vast selection of pictures and videos of Native Indians. The pictures show the clothing, weapons and decorations that can be used as a really useful educational resource for kids and children of all ages. Our series of videos enable fast access to the images, pics, paintings and pictures together with information and many facts. We hope that this article on Five Civilized Tribes will assist in your studies or homework and that you will enjoy watching the videos featuring many pictures of the Native Indians.